By 2025, the cost of fuel will have driven many to reconsider how they live; it will drive urbanisation as it will become too costly (in Europe at any rate) to live far from shops and public transportation. Perhaps subsidies will be needed for farmers. There are fears that the costs of transport will rise to such a level that regions will have to be self-sufficient. This could drive us to the fragmented, subsidiarity based world. We tend to see the world supply side as being OK to around the scenario period. The difficulties are those that come after this. So the question is not what supply and demand, prices and security are in 2025 so much as how people are going to think about this in 2025. This is a long run industry and work is now underway on anything that will be a significant element at that time - and the same will be true then. If there are no good renewables - and only solar has a vague promise of working with the scale and reliability that the industry needs, in our opinion - then we will just have to go on with conventional energy. There is lots of that about, whatever people say about "peak" this and "peak" that. The issue is twofold: emissions, and political supply security. There will be hard choices ahead if we run into this situation, and rough politics in the background. Decisions will have a "green" element but hard-headed issues will come to the centre stage. I really found the paper on fusion helpful. Great if the LENR thing works. It is truly interesting to look at company and institutional assessments of energy demand in this period - broadly, they all say roughly the same - 17-20 MTOE - and they all have pretty much the same fuel mix. Like Comment 2 said, there is no problem supplying this, it's just a problem doing so an sticking within CO2 limits - one - and not being dependent on people you don't trust to stay stable - two. That brings policy makers to a Big One, which is how much is solving those two issues worth? Also, if you solve the CO2 issue, that may not happen in your country and so you may not change supply security that much. Europe is talking about Saharan solar - well, great if it is economic. But you then depend on those countries. Also, the killer for me, you cannot really rely on renewables as currently defined. Never mind the cost, they just have not run for long enough for us to be sure of a No Swan situation. So what I see is a slow taper, from what we know to what we don't. That may be "renewable" in the sense that an activist would use the word, or it may not. I rather hope that it is not, as all the renewables that we are being urged to use - except solar, perhaps - are not attractive. So this What If isn't really helpful, as we know pretty well how it will go. Pretty defeatist stuff, Comment 3. We could be on the edge of a climate catastrophe. (Or yes, we also might not, I just don't know.) Point is, if we have not proven these things, we will not know which one to choose if we have to. That is worth money in its own right. So is supply security / volatility management. My big worry is not actually climate, it's price volatility. As supply goes down to just a few countries, so spare capacity will also go down. (Why would they carry spare: tight capacity spells high prices.) So every accident and weather pattern will have traders in a frenzy. Countries will carry big stock to offset this, which will cost; and they will try to unload this when skies are blue, making volatility worse. The knock on to economic volatility is obvious. Second, countries will try for bilateral deals. Exactly how these go around the market is always down to two things. Either they own equity production that the operator is forced to repatriate, at whatever opportunity cost, or they offer forbidden guns for oily butter. This need not be a physical exchange. It can be support in the Security Council, for example, or solidarity with a given political position: that of Venezuela, for example. It may be sanctions busting or it may be the evasion of judgments against the country in question, ahem Argentina. This more subtle form of bilateral creates disorder, blocks and a nasty black economy. That, in turn, makes an orderly international environment harder to establish. Basically, a protection racket. Note how quickly energy issues change: fracking has crashed US natural gas prices, Venezuela is now the possessor of the largest reserve base in the world; one minute we have a nuclear freeze, the next a nuclear revival. Yes, energy is slow to implement, but I am quite certain that if we found ourselves in a war-like situation we would move truly fast. The trouble is for me that if the problem is specifically environmental, the solution will not be primarily "to do with" energy. Legislators will listen to people with axes to grind and take electorate-pleasing actions - pretty, visible stuff like wind farms rather than big gray plant emitting steam - and not go through the economics and technical grind that really delivers energy solutions. To call for "better energy policy" misses the point - politicians don't understand what "better" means, don't understand the context. This text is written by Ed. to capture the substance of a length conference call between executives three Latin American state oil companies and/or regulators. There was also US and Asian government input. Ed. has also pinched some statistics from the recent Economist article on this subject. Gas has been an unpopular find for oil producers, as it is difficult to transport. Countries far from markets which have large gas reserves - such as Qatar - have, until recently, done less well economically than their oil rich neighbours. As a consequence, in exploration carried out far from market, gas was usually an accidental find rather than an object of pursuit. Global reserves have, nevertheless, grown steadily for the past two generations, and production began to grow faster than oil from about 1990. The chief driver of this has been the lesser environmental impact of gas, notably when it is used to substitute for coal in power generation. Taken together with the decline in economic activity after the 2007 crash, the use of gas has been responsible for the 5% decline in net US carbon dioxide emissions, and as natural gas does not normally contain sulphur compounds, those of sulphur dioxide. This in turn lessens the cost of emission permits, Gas offers lesser advantages, such as fast switching times and access to increasingly efficient turbine arrays, and plant are far cheaper and quicker to build than the viable alternatives that meet environmental requirements. Decommissioning costs are also far more attractive. A secondary consideration, particularly for states, has been supply diversification and a means to manage erratic energy costs as oil production runs closer and closer to global capacity. Oil is becoming very expensive, and looks set to remain so. All of this should point to a "gassy" future. However, whilst absolute expansion seems on the cards - perhaps by as much as half as much production again - the overall share of gas is currently about a fifth of global primary energy and most forecasts put it at nearer a quarter by 2030. The complex and costly systems used in energy transmission and use are innately slow to develop. One can, however, overstate the inertia of the energy industry. The US has doubled its gas reserves in the past few years. 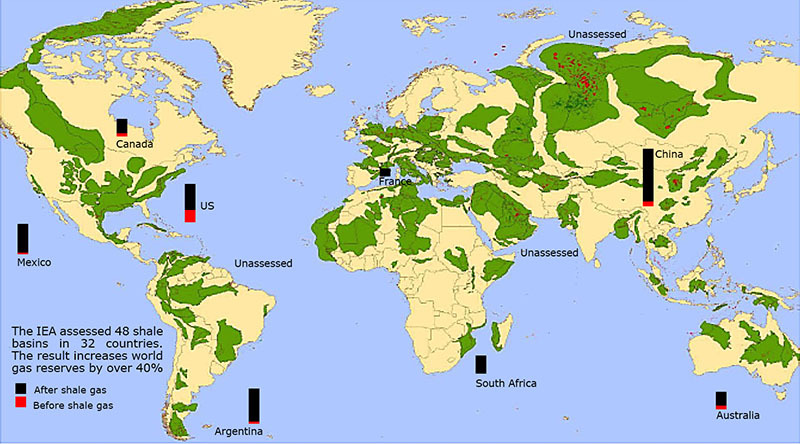 It now has 70 trillion cubic metres of reserves, half of them "unconventional", that is, due to active deep-shale fracturing, or fracking. President Obama suggested that the US was now self-sufficient for gas for the next century. Other countries which have looked for such reserves have found them, sometimes with dramatic consequences: China increased its reserves from four to forty-eight tcm. Argentina has gone from 2 to 23 tcm, Mexico from 3 to 20 tcm, Australia from 7 to 32 tcm. Fracking came on the scene in the US after the turn of the millennium. In around ten years, it has come to supply a third of US gas requirements. The factors that brought this about are complex, as much due to pipeline common carriage (the right to put you gas through other people's pipelines for a fee) as to technology. Indeed, the technology - deep drilling, horizontal drilling, enhanced oil recovery techniques such as sand injection applied to gas - were all known long before they were applied to fracking. It is significant for students of innovation that the effective synthesis of all of these factors came not from the major oil and gas producers but from a small oil field service company. Fracking has, in effect, probably doubled world gas reserves if the unevaluated areas are taken into account. It will have profound effects on the entire energy industry. The remainder of this text explores what the effects are likely to be. There is no global gas market, at least in the way that oil or copper are sold at a unified like-for-like price. This is a legacy of the fact that gas is difficult to transport. A field would discharge to a single pipeline or LNG (liquefied natural gas) contract, which would supply a single customer - such as a utility - or a range of customers, such as industrial giants. Deals were set on this idiosyncratic set of arrangements. This was particularly true of Japan, an early adopter of LNG as a consequence both of its internal low energy supplies and its decision to diversify away from oil in the wake of the 1973 cartelization of oil production. Others in the region followed suit. Europe, by contrast, has moderately diversified supplies. These have been undergoing major - and instructive - alterations. Europe lacks a fully integrated network, Its contracts tend to be long term, to be indexed to the price of oil and to be of a "take or pay" nature. Indexation to the oil price of course both amplifies gas price volatility and reduces gas-to-oil competition. There are a few major suppliers - Russia, Norway, Algeria - and the contracts that these hold are almost all of this nature. Russian exports of gas to Europe account for 10% of Russia's GNP and a crucial proportion of its exports. Contract length has crept down, from nearly 30 years on average in the 1970s to less than ten years in the early years of this century. Two factors have recently come into play that have radically changed this picture. Qatar began imports of LNG (liquefied natural gas, transported by sea) to Europe. These shipments are sold on a spot basis, usually at a price which undercuts Norwegian and Russian oil-indexed contracts. German utilities, which have the majority or long-run take-or-pay contracts are in considerable financial trouble. The suppliers have agreed to allow renegotiation of these contracts, and now offer a spot element in their take-or-pay contracts. As a result, roughly half of the European gas market has now become spot-based, transforming itself in a few years. However, Qatar has found outlets in Japan following the tsunami and the Fukushima crisis, and the massive gas glut is now lessened. That leaves a new situation, as Russia - the supplier of a quarter of European demand - now has the potential to manipulate the new spot market in a way that it could not in an oil-indexed world. Once again, shale gas and fracking may alter this situation. Europe has the correct geology for very considerable deposits. A boom of the sort already realised in American would have profound effects. It would, of course, reduce dependence on Russia. It would force a more networked approach to gas supply. Naturally, gas users will be unwilling to enter into long run contracts when many parallel sources become available. It would reduce the attractions of the more expensive offshore exploration. Europe therefore needs both to rethink its gas market, and to diversify its supply further, in order to avoid market manipulations and to bring down its energy costs. It is worth noting that European gas costs over four times as much as gas in the US. One potent mechanism for diversification that runs in parallel to fracking is LNG. From brave experiments in the 1970s, this has grown to a virtually routine process - routine, but extraordinarily capital intensive. The Australian Wheatstone project will cost around $30bn to build, moving 10-15 billion cubic metres of gas a year. In general, industrial activities tend to move down an "experience curve". This means that costs fall in proportion to the logarithm of the cumulative experience in the industry. Oil transport costs are quarter of what they were after World War II; and LNG is perhaps 20% as mature, in this sense, as is oil. Costs will, therefore, continue to fall, volumes to grow and the impact of global gas supplies on regional markets will certainly follow. The once-universal indexation to the price of oil - save through market mechanisms - is also probably doomed. This may happen quite quickly in the event of oil disruption or environmental emergencies. Qatar has, for example, gone from a minor player to the world's largest LNG exporter and trader in ten years. However, all of this would come at a price, as these plant are demanding of capital, specific human resource and dependent on immense quantities of physical goods, such as steel. Environmentalists tend to be unhappy about all of this. There are two reasons, one cogent and the other less so. The sensible point is that whilst methane burning emits less carbon dioxide per unit of energy liberated, and usually uses that energy more efficiently, it nonetheless is far from carbon neutral. It ameliorates pollution, but it does not remove it. Indeed, the very source of efficiency in the gas flame - its high temperature - causes it to fix atmospheric nitrogen and so give rise to undesirable NOx emissions. A technology that allowed methane to be burned in fuel calls (no NOx, even higher efficiencies) will help. At present, such cells tend to coke up after a few hour of use. A profound technical "fix" would consist of carbon capture and immobilisation or storage, the former by reacting the carbon dioxide with minerals such as perovskite, the latter by reinjecting the waste gases into exhausted gas wells. These techniques have major economic and efficiency overheads, however. The less cogent reasons are a scattershot of objections. Fracking is said to allow gas to leak into the ground water: it does not, as these are separated by thousands of metres of rock. It is said to generate earthquakes: if it does, they are hard to observe. Fracking does indeed involve local disturbance - typically, a well will require a working area of half a hectare during operations - a year - but the long production phase consists of a well head and a pipe. It does, however, take a great deal of water during the process that fractures the shale rock. These unconnected objections really stem from a deeper conviction, which is that "we can't go on like this", to which fracking seems to reply that "yes, we can". Fracking is a big industry, big technology, internationalist solution of precisely the type that sets the hackles rising on a certain type of environmental activist. Pressure against the industry will therefore continue, but so long as there are no major accidents - LNG and close-to-market storage being two vulnerable points in the chain - this activism is unlikely to spread into the general population to the extent that objections to nuclear power have done. In summary: the gas industry is a case study of how a single technology can trigger major structural and institutional change, but how the realisation of that change has almost endless ramifications. It also suggests how near-impossible it is for policy makers to anticipate such changes. As a group with a profound interest in the future, we should draw a lesson from this. Structures that are focused, flexible and which have a clear objective or objectives are those which, when left to themselves, will produce remarkable and adaptive behaviour. Systems that are regulated to a single end, or which are under the influence of an industry hive mind, are those which are far less likely to adapt. Don't write off renewables. I know the problems, but solar does have its possibilities. Last year, US Energy Secretary Stephen Chu indicated that solar PV can compete withour subsidy against both coal and gas at lifetime costs of $1/watt. That implies cell costs fo about $0.50 per watt. 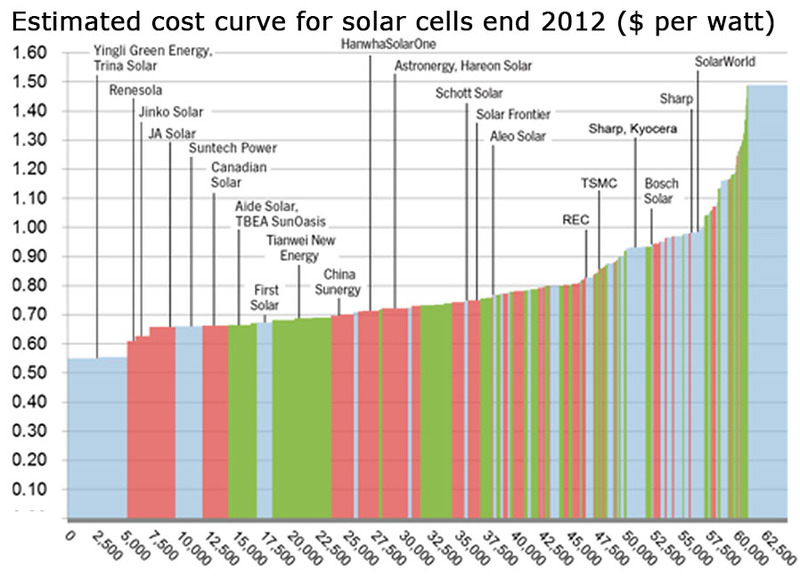 The figure shows the cost curve for solar cell cell production as forseen for year end 2012. The lowest cost producers are already at 50c. A 100 kilometre square grid could supply US power demand, given energy storage. That truly is not large: 10 km square, or the size of a mid sized city. He goes on to say that by 2020, based on a field-by-field assessment, there will be 49 million barrels per day of oil production (as crude oil and natural gas liquids), or over half as much again as current oil demand. His low production figure is an additional 17.6 mbd, which is still the fastest growth since the 1980s. He says that "This oil revival is spurred by an unparalleled investment cycle that started in 2003 and has reached its climax from 2010 on, with three-year investments in oil and gas exploration and production of more than $1.5 trillion". Taking into account risk factors, depletion rates and reserves, the four countries with the greatest production growth potential are Iraq, the U.S., Canada, and Brazil. He suggests that just as fracking has revolutionised gas deposits, so in situ shale oil production will have enormous benefits not only the countries such as Canada and the US, which have enormous deposits of it, but the technology will have a great effect on oil recovery from current reserves, where the average recovery is still around 35%. He notes that most US shale oil is profitable down to crude prices of around $60/bbl. He turns to energy prices, noting that the margin between price and production cost is at a long-run high of about $25/bbl. There is a bridge point in around 2015. Before this period, a price fall would halt many projects. After that time, these would be in place and production would be committed at marginal cost. That is a view that runs decidedly counter to the zeitgeist. Maugeri was a senior executive at Eni and his views hold weight amongst analysts. This does not stop some of the more pessimistic from tearing their hair about this. A synthesis of pessimistic reports point instead to a 4% decline in production from established fields, twice the number used by Maugeri. That would require a Saudi's worth of new oil (12 mbd) of new production by 2020. These reports see fast declines in the old, huge fields, and new production from small reserves that tend to decline rapidly. The key difference between these and the Maugeri paper are, therefore, the assumptions about technical progress that have been made. As an example of the critique, Steven Sorrell of the Sussex Energy Group and Christophe McGlade from UCL Energy Institute have published a criticism of the Maugeri document. They say that both the IEA (2008) and CERA (2008) have estimated decline rates from a globally representative sample of post-peak fields that are actually more extreme than the 4% mentioned above. The Oil Drum, a site where geologists and analysts let downtheir hair, is generally negative. So, the world energy outlook depends considerably on how you think about developments in oil industry technology. Clearly, on the positive side there is the example of fracking and equally, there are many projects under development that could have a profound effect on oil recovery. How quickly and how uniformly these will be applied is unknown. However, the fact that the outcomes of a substantial implementation for the industry are so extreme, and that the politics of self-sufficiency are so effected by them - suggests that this a balance worth watching. It may be true that fast change between energy sources is very slow to arrive, but that is far from true about new technologies employed within traditional sectors. Look at CCGT, if fracking seems a degree over-extended.